Cooking and Serving Food is going to be fully automated in future. Robot Chef is available for cooking. A robot chef, Motoman SDA10 of Yaskawa Electric Corporation successfully demonstrated cooking of Okonomiyaki, a Japanese savoury pancake in 2008. 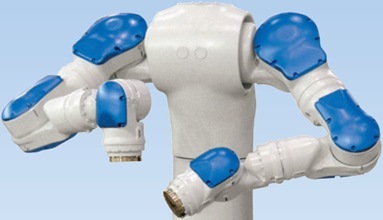 The manufacturer planned for selling 3,000 units of this industrial robot from 2010 onwards. Also, there is a mobile autonomous robot known as Snackbot developed by Carnegie Mellon University as a research platform for projects in robotics, design, and behavioral science. It also serves snacks to the inmates of the University. Here is Motoman SDA10 that was modified as robot chef and Snackbot. Motoman SDA10 from Yaskawa Electric Corporation.